If you have a dog, you are well aware of the expense that comes along with grooming your dog regularly. Depending on the breed of dog, your grooming expenses can run up quite a bill in a short amount of time. In fact, according to a recent nielsen.com conducted by Harris Poll, Americans spend about $166 million annually on grooming for their dogs. Owning a dog can be expensive as it is, so many owners look to save money where they can. One of the best ways to save money on your dog is to groom them on your own instead of paying the cost of a groomer. While it can take some time to become comfortable with grooming your dog on your own, it will eventually come naturally to you and you’ll be able to save money on grooming expenses. To properly groom your dog, you’re going to need a good pair of dog grooming scissors. Luckily for you, this guide breaks down what you should look for in a pair of dog grooming scissors and provides several different product recommendations, so you’re sure to find a pair that suits your needs! If you’re in the market to buy a pair of dog grooming scissors, there are a couple of things you should keep in mind and look for when you go to buy them. ​It’s important to make sure you find a pair of scissors with rounded tips so that you don’t have to worry about accidentally stabbing your dog with the end of the scissors. While most scissors include this feature, there are some that don’t, so make sure you keep your eyes out for this feature. As with just about any blade or scissors, you want to make sure the blades are made of stainless steel. Not only will stainless steel last you longer and provide more durability, but they will also help provide better cuts of your dog’s fur and eliminate pulling and other discomforts. 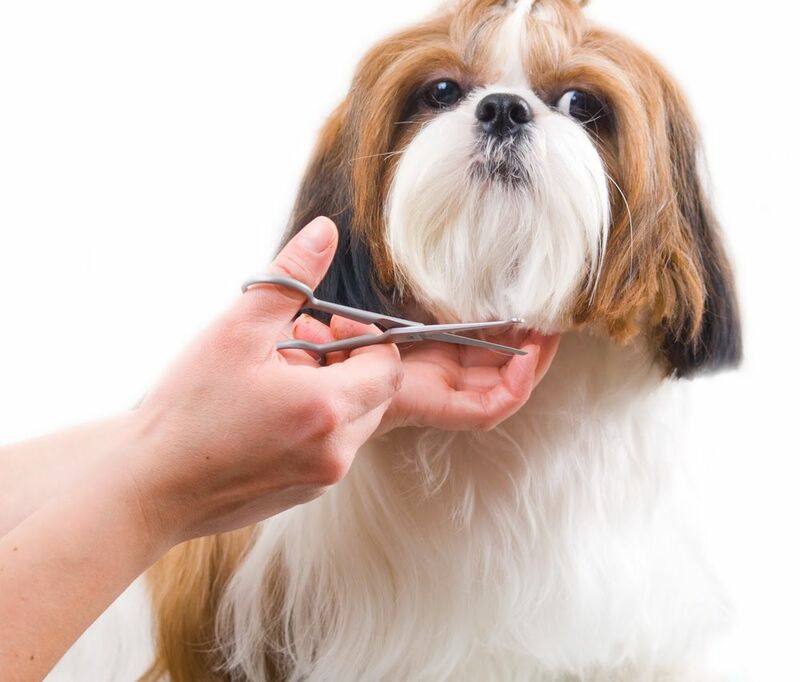 While the grooming scissors will be used on your dog, the comfort of holding them in your hands is one of the most important factors of, choosing the right pair. Try to find a pair with an ergonomic grip or comfort rubber grips to help provide plenty of comforts when using them on your dog. The Pet Magasin Grooming Scissors Kit comes with two different pairs of scissors designated for use on different areas on your dog. One pair is meant for the body of your dog while the other pair is meant for the face, ears, nose and paw areas. The blades come pre-sharpened and are made of surgical stainless steel to provide perfect cuts every time. The tips of the blades are rounded, so you don’t have to worry about accidentally hurting your dog while grooming. The Tiny Trim Ball-Tipped Small Pet Grooming Scissors are the perfect option for smaller dogs who need grooming, but they also make the perfect option for the smaller areas on just about any size dog. With a serrated blade, the fur is better held in place for cutting to provide the best cut possible when dealing with delicate areas. Like some of the other products on the market, this best pet grooming scissors feature rounded-tip blades, which help eliminate the concern of injury to your pet. The Conair PRO Dog Round Tip Shears are lightweight and comfortable and feature coated blades to help create a non-stick, smooth surface when cutting your dog’s hair. With rounded tips for safety, the Conair PRO Dog Round Tip Shears is ideal for facial trimming and grooming in sensitive, hard-to-reach places. Also, this pair of scissors features unique soft-grip finger holes and built-in finger rests to help make grooming even more comfortable. For best performance, it is recommended you always make sure your dog’s fur is completely dry and free of tangles before cutting. Spending a lot of money on one pair of dog scissors and making a set slowly just doesn’t pay off. Especially when you can buy a snazzy set like this which takes care of all of your troubles for you. People usually just trim their dogs and tend to forget how important it is to detail the fur. This set is perfect for that. The razor sharp edges glide through the hair effortlessly and detail every inch the way you desire. What’s more, it’s going to be very easy handling these scissors and trimmers. This is all thanks to the handles which were designed to fit your hand perfectly. If your pup has a problem with a lot of tangles, then you can use the thinning sheer which will solve that instantly. Dogs with heavy layers will appreciate the thinning trimmer the most. This set includes thinning, straight, and curved shears alongside the accompanying combs. The coated titanium and stainless steel they’re made of really make a difference during the haircut, as you can see and feel how easily it is to cut and trim the hair. These scissors are most convenient for long-haired dogs, but that doesn’t mean that they can’t be used for short fur. The steel comb comes in handy when you want to untangle pesky fury which you’d have to cut otherwise. Furthermore, it’s capable of removing loose hair and dirt as well as mats. On top of that, these scissors have one very useful feature. The screw is adjustable so you can separate the scissors for cleaning and sharpening. The Kingstar Stainless Steel Professional Thinning Shear is one of the best professional dog grooming scissors. This is a four-piece grooming kit with three different pairs of scissors and a comb to help groom your dog perfectly every time. ​Each pair of scissors is made with high-quality stainless steel coated with titanium for maximum durability and style. The blades of the scissors are smooth, sharp and durable to help eliminate any friction while cutting your dog’s hair. Each pair of scissors is ergonomically designed to provide you with maximum comfort while using them and helps suits all of your grooming needs. The Dog Grooming Scissors by Boshel are ergonomically designed for safety and comfort and with easy, superior control, these are the perfect grooming scissors to use around your dog’s ears, face, nose and paws. ​The super sharp micro-serrated stainless steel blade allows for a perfectly clean cut to reduce any catching or pulling of hair. This Dog Grooming Scissors also feature rounded-tips to ensure the safety of your pet while in use. The cushioned anti-slip handles and removable handle rings make long grooming sessions even easier as they provide maximum comfort. Everyone knows that the most important thing about grooming your dog is safety. You don’t want to knick your pup by accident or cut it. This is why scissors with safety tips are a must. And that’s just the kind of feature these scissors have. The rounded tips ensure that every part of your doggy is safe and sound during the haircut. The second part of a haircut without stress is having a secure grip on the scissors, which is exactly what these offer, thanks to the additional grip inside the handles. That grip also makes your hand less tired and more comfortable. The kit contains everything you’ll need for a nice grooming session, and that’s the facial scissors, trimming scissors, and thinning trimmers. If you’re looking for outstanding scissors which will leave your dog looking stunning, regardless if you’re a professional or not, these are the scissors for you. They’re made from Japanese steel which guarantees extreme durability and top notch quality. In fact, the grooming scissors come in a pack of four, so as to accompany all of your needs. We all know that the hardest part of trimming a dog is its face. This is why the there are specialized small scissors in this set, with micro separated blades for added precision. The small scissors can also be used for paw trimming. One of the primary features you need to pay attention to when buying scissors for cutting your dog’s hair is how the scissors fit into your hands. You should look for ergonomic scissors which allow you to feel the pressure while you’re grooming your dog. These scissors should have finger tails which can comfortably hold your fingers and help you glide smoothly through the fur. In other words, you should look for these scissors. They’re the dictionary definition of comfortable and light, as well as having the above described features. What’s more, the safety tips will make the experience more comfortable for you and your dog. This is simply because you’ll know that you can’t accidentally cut your pooch, and it the relaxation will transfer to the pup. A professional’s dream is to buy adequate scissors without having to spend a ton of money. And this is a professional’s dream come true. The scissors are slick and elegant, further enhancing your experience with using them. Don’t be fooled, though, these aren’t just pretty. They’re very durable and have been made of stainless steel, so the quality can’t be questioned. On top of all this, you can even order them in two different sizes (7 or 8 inches) depending on your needs and preference. Anyone who’s ever cut hair on a dog will tell you that the hardest part is taking care of the hair on the pup’s face. This is because you need extra precision to reach the small hair and clear your dog’s field of vision without accidentally nicking its eyes or nose. This is why it’s important to have good quality scissors for the face, as safety comes first. The second most difficult part to properly cut is definitely the dog’s paws, and you can safely shape the fur there, too, with scissors like these. They’re so safe because of their size, but also because of the rounded tips. These two features combined ensure that you won’t accidentally cut the skin of your dog. And isn’t that the most important thing in this delicate situation? For those looking to add a little style to their grooming, the Sharf Gold touch scissors might just be the perfect match. And that’s not just because of the eye catching gold touch. These are 7.5 mm curved scissors, which were made from Japanese steel. In fact, these are 440c stainless steel shears. Anyone who knows anything about best dog scissors will tell you that the ones made from Japanese steel are the best. It’s not advisable to use them if you’re not someone who’s had a lot of practice with grooming dogs simply because more advanced users will be able to take advantage of their full potential. What’s more, your dog will surely appreciate the style curved scissors offer. Did someone ask for a stainless steel construction and very durable and strong scissors? Cause here they are. This set includes everything you’ll need for the perfect haircut. Thinning scissors are especially useful during haircuts as the dog’s fur tend to be very thick, so before you give the fur some detail with the cutting scissors, you’ll have to thin the fur nice and easy. And so the final results are even more stunning, use the curved scissors! What’s more, all of the scissors in the set are ergonomic, which means they were designed to reduce problems which as achy elbows, hands, neck, or back. This is a very useful feature because you’re bound to be cutting hair for a while. If that wasn’t enough, a comb is also included to make matters even easier. The only thing better than purchasing a great quality scissor kit is getting some extra things along with it. Well, here you’ll get a bonus grooming comb, a stylish black case to keep your stuff in, and a cleaning cloth. As far as the rest of the kit is concerned, it’s equipped with trimming, thinning, and curved scissors. In addition to being the perfect set for any professional groomer or anyone who likes to take care of their own pet, these scissors will be the only ones you’ll need thanks to their superior durability. There are also adjustable screws which make it easy to clean and sharpen your kit, as well as tighten it if need be. And because this company believes that your pet should be safe during the haircut, the scissor tips have been rounded, while the finger holes are cushioned, for extra comfort and control. There are numerous scissors you can research and look at online, and we’ve named some of the best on the market, but it’s all useless if you don’t know what to look for. This is especially true if you haven’t done much dog grooming in your time. It’s not a big deal, though, as there are some things you should keep an eye out for, and thankfully, they’re not hard to remember. First of all, you should be aware that there are several types of scissors and that no two are by any means the same. Each type has its own unique purpose and will give you different results, depending on what you want to achieve. Coat scissors are the first type we will mention. They’re the most general scissors you can buy and are used for grooming in general. Simply put, they let the groomer carry out the bulk of trimming which accumulates all over the body. They can be purchased in many different sizes, depending on your needs and preference. The design of these scissors is for the sole purpose of comfort during the whole grooming experience. Scissors with rounded tips are naturally called rounded scissors. These are great for several reasons. They give more confidence to a new groomer as they are much easier to use. And if you’re dealing with a nervous dog which doesn’t really like to be groomed, you’ll want to use them so as to avoid accidents. Keeping with the tradition of self explanatory names, thinning scissors are used for thinning the dog’s coat. They’re there to reduce the volume rather than length and are especially useful for scruffy puppies. It’s important to realize that the finger rings on the scissors can become worn after many uses. That makes the scissors more uncomfortable to continue using, and less safe because you won’t have as much control over your grip. Worn out finger rings don’t have to be a reason to buy new scissors, though. If they’re removable, you can simply get them out and put new ones in. They’re fairly cheap and can be purchased as spared parts. What’s more, it’s useful to have rings like this because that means that you can easily change their size, depending on the size of your fingers. All of this provides a more confident grip, which is essential for a safe and fast grooming session. As this next paragraph will confirm, finger comfort is essential for a proper haircut. That’s why you should opt for scissors which have a finger rest. This refers to the part of the scissors which can extend to accommodate the little finger. This little rest makes the world’s difference because they allow for a better grip which makes cutting easier. Scissors can have up to two finger rests, and you can even remove them on some models. Finally, let’s not forget the clicker plate tension control. This useful feature allows you to adjust the tension you feel while cutting hair. These two words used to mean very different things in the olden times, but today they are synonyms. That means that it doesn’t matter if you’ll refer to your grooming equipment as scissors or shears because they mean the same thing. Well, Egronomics is, simply put, the science of how the body moves. People have done a lot of research to see how the body moves naturally. For example, drawing your ring finger to your thumb while your hand is extended feels unnatural and straining. This used to be a very big problem in the beauty industry and it even led to an increase of arthritis. That’s why, now, you can scissors which support the natural movement of you and your pet, which allows you to be much more comfortable while you’re grooming. ​There are, but you really have to be careful about finding the real lefty scissors. The most obvious difference between scissors for the left and right handed is the placement of the ring holes. Some people even try to use the wrong type of scissors thinking that it doesn’t make much of a difference. The thing is, if you do this, you won’t have a very nice experience while grooming. There are specialized scissors for the left handed that you can look up online. If you’re not sure whether you’re using the right kind of scissors, you can perform a very simple check. The cutting edge of the blade closest to your hand should be facing the ceiling. This isn’t to say that cutting with scissors for the right handed is impossible, it’s just that it makes one hell of a difference when you use proper shears. 4. What are the different types of edges scissors can have? We can differentiate between three types of edges when it comes to shears. The first one is the Convex edge. This is the modern edge, which cuts very smoothly and easily. Professionals are likely to use shears with these edges as they perform much quicker and last longer. They’re not for home use because of their price. You can buy them, but you won’t really use up their full potential unless you’re a professional groomer. Then we have the serrated edges. These are made of stainless steel and that makes them very durable and increases their overall quality. It does have one small drawback, though. The stainless steel is rather slick and that can sometimes lead to hair being pushed forward instead of cut. The third type, the beveled edges, have a delicate solution for this problem. This is the oldest kind of blade, and it’s fairly easy to make. Scissors made with this edge are generally heavier and need a bigger push to perform properly. They’re definitely not as smooth as convex edges, but, unlike serrated edges, their edges are micro-seriating. This feature holds the hair in place and makes it easy to cut. 5. What’s the difference between steel and stainless steel? The difference isn’t all that great; the main point is that stainless steel is less likely to rust. This is due to the making process of both of them. When ordinary steel is made, an explicit amount of carbon is added to make the iron harder, and that’s pretty much all there is to it. But, when you’re making stainless steel, you add some chromium to ordinary steel. This chemical is prone to rust. And if you really want to do a good job, then make sure that the surface you’re working on is highly buffed. When you’re going to decide on the best pair of dog grooming scissors for all your needs, it can be tough to figure out which pair of scissors is the best. There are plenty of different options available and each has their own set of features. When deciding on the proper pair, it’s important to consider whether or not the scissors have rounded tips, if the blades are made of high-grade stainless steel, and if the handles are made of a comfortable material that provides maximum comfort when in use.The six products mentioned above are all tailored to fit just about every dog owner’s needs. While there are likely a couple of different grooming scissors mentioned that would fit your needs, make sure you find the one that fits the majority of your needs. Purchasing the proper pair of grooming scissors can make or break your grooming experience. By selecting one of the products mentioned above, you will be sure to have a pair of grooming scissors that can handle anything.